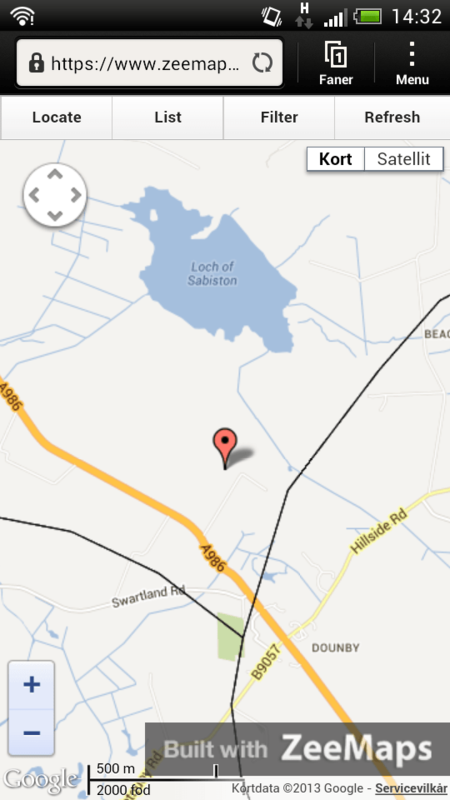 This is the third instalment in a series on geocoding. The first instalment was published in May, and the second was published in July. Some of you have probably been working with GIS – Geographical Information System – in connection with your place-name research. Or you would like to enter into this interesting and complex field in order to analyse and present your data in a better way but haven’t dared to do so just yet – or the money to put into GIS software. Traditionally, GIS software has been quite expensive and the two big software companies ArcGIS and MapInfo still command a hefty price for desktop versions. Recently, however, a number of free or reasonably priced alternatives have surfaced on the market, such as Quantum GIS and Global Mapper – and even more recently GIS programs as online services. The online GIS systems all have the same in common that they are restricted in features in comparison with GIS desktop systems. This is not necessarily a negative thing, as GIS programs are generally complex and at times unintuitive. Depending on the online GIS service, features usually range from mere display-only systems over data-edition facilities to also include basic GIS calculations and spatial analyses. 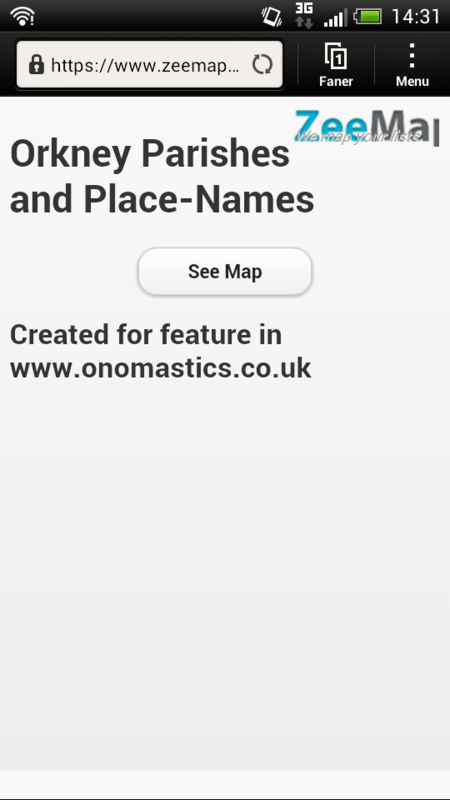 However, when it comes to present place-name data and possibly some underlying administrative data online, our needs as onomasts are usually not overly great, so the online GIS solutions offer an easy way for us to ‘go public’ with our research findings. The online GIS services are getting more and more numerous these with both free and subscription possibilities. Among alternatives are: ArcGIS Online (http://www.arcgis.com/home/), GISCloud (http://www.giscloud.com/), MangoMap (http://mangomap.com/), MapInfo (http://www.mapinfo.com/products/web/) and ZeeMaps (http://www.zeemaps.com/), etc. For this feature, I will have a look at the free options of two of these services, namely MangoMap and ZeeMaps. Both MangoMap and ZeeMaps will allow you to publish both point, line and polygon data, but in different ways and with different results. Both services are also relatively simple to upload into and publish from. 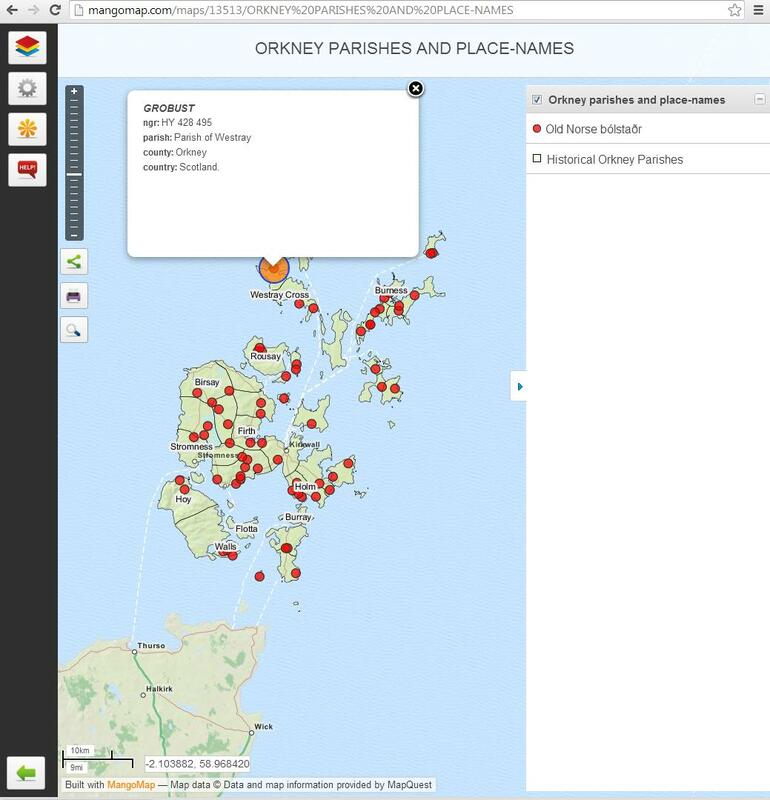 My starting point is two GIS-themes in MapInfo format (.tab), one is a polygon map of the parishes of Orkney as they occur in the 1492 Rental of Orkney created by my colleague Peder Dam here at University of Copenhagen. The other is a point map of the place-name type Old Norse bólstaðr of my own creation. In addition, the bólstaðr-table is linked to an Microsoft access database for easy editing. The exercise is then to transfer the data from my MapInfo desktop environment onto the internet with as little functionality loss as possible. ZeeMaps uses an upload interface which is reminiscent of that of BatchGeo I have written about in an earlier feature, as it is possible to batch upload by means of patching your data into an online copy-and-paste table or by uploading your data in a spreadsheet. This, however, only seems to work for point data. Line and polygon data have to be uploaded as kml/kmz files – the file format used primarily in Google Earth. The bólstaðr-map, consisting entirely of points, was relatively easy to transfer to ZeeMaps, as I just copied the data from the associated Access-table and fed it into the site’s copy-and-paste table. Table validation occurs straight away but the map itself takes some minutes to generate. Once uploaded, it is possible to set the size and colour of your markers for points and assign labels and label info to them. I chose not to assign any labels, as labels tend to make maps look cluttered. In addition, ZeeMaps have a nice marker overview list, as can be seen in the right hand side of the screenshot in Figure 1. Line and polygon data have to be uploaded by means of the Google Earth kml/kmz-format. That is not a great problem, as MapInfo has a plug-in for creating this type of files, so such a file was generated in a minute or two. Uploading was very easy, and it fed onto the map immediately, which surprised me somewhat, as points took some minutes before they appeared. With line and polygon data, the colour scheme and layout is fixed and stay in the way as they were created as kml/kmz files. Surprisingly, it is not possible to derive any information from the polygon layers as it is in Google Earth, which is a bit of a letdown. Once published, the uploaded data appear with fixed, standard Google Maps/Google Satellite issue as background. Aesthetically, ZeeMaps offers a simple and clutter free map which, however, borders on the slightly old-fashioned in appearance. 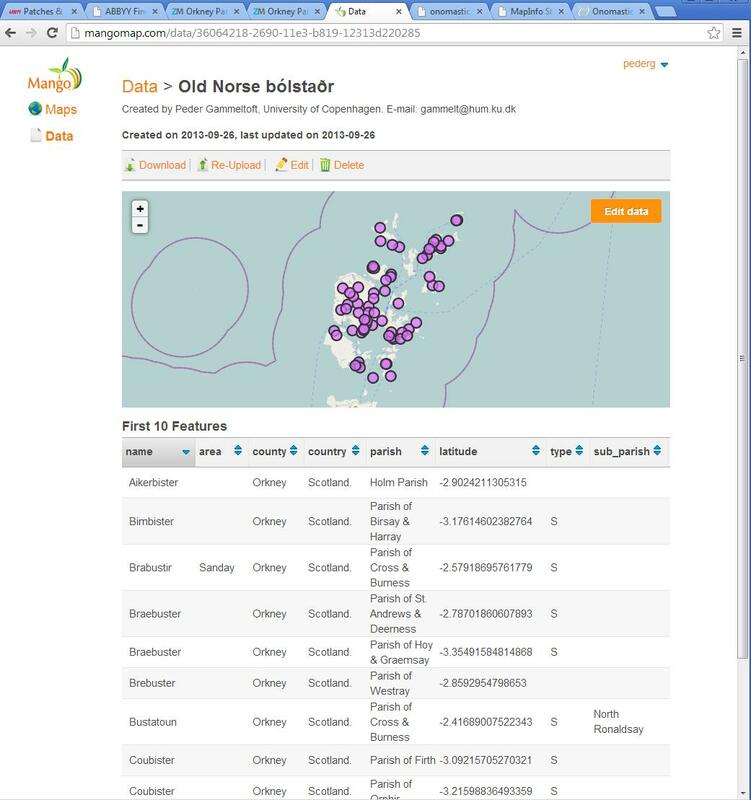 The functionality of the site is quite good, though, as the point data table (the bólstaðr-map) can be accessed on an expandable list in the right side of the screen. Here the points are listed alphabetically by name and when clicking one of the names in the list, the table information pops up in a data window on the map, as can be seen in figure 1. The same information can, of course, be viewed if clicking on one of the markers. Individual markers can be added to the map, but deletion of markers, even single markers, is a pay-option only for some strange reason. Even more nifty is the way in which the maps are automatically adapted to mobile devices – an example can be seen in Figure 2a-c, where the user is first taken to a welcome-screen (Figure 2a). The map itself (Figure 2b) is pretty similar to desktop versions, but when clicking a marker for information, the information is not displayed in a data window on the map but rather on a separate page for displaying data. Again the design is simple and clutter free but the design does seem to work better for the mobile devices than the desktop version. I have not seen this feature elsewhere and that surprises me, as I am surely not the only one who makes use of user-genereated maps in a mobile device. Top marks for this feature. MangoMap is a good deal more sophisticated in the outset. Not only is the layout pleasantly modern and well designed to look at, data also has to be uploaded as ArcGIS format (.shp), which is a genuine and well-established GIS-format. MangoMap also requires you to register but this is a relatively simple affair and quickly done. Once registered, the interface in its bold but pleasant graphics, asks you to create a new map by clicking on a button. Doing this takes you straight to the map interface where you are asked to upload a new layer in ArcGIS shp-format. My MapInfo themes are not in this format but MapInfo has a plug-in, Universal Translator, which allows for relatively easy transfer of tab-format themes to shp-format. So having done that, I open the upload feature which supplies you with information on which files you need to upload in order to upload the entire GIS-theme. All in all the upload feature is pretty foolproof, as it will not upload data if there are file extensions missing (GIS themes consist of a conglomerate of files that have to be present in order that the theme to be working properly), or if you have added a file extension belonging to another file by accident. So full marks for that. Once you have all the files for you theme uploaded, the map genrerates in seconds and you can see the result immediately. Unlike ZeeMaps, the possibilities of personalization are much greater and adjusting the size, colour and opacity of points and of the borders and surfaces of polygons is a doddle. There are several maps to choose from, including the relief map I have used as the background map. The resulting map (Figure 3) is quite pleasant to look at and quite stylish in comparison to ZeeMaps. 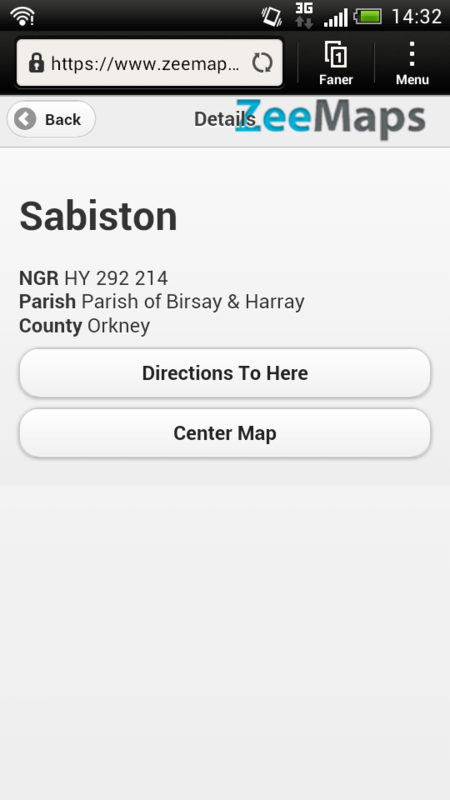 Both layers, the parish polygons and the bólstaðr points are clickable on the map. 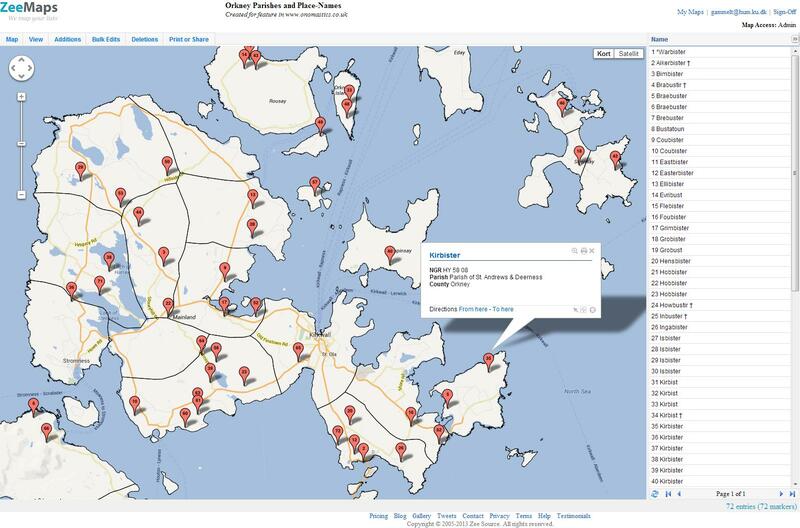 The information pops up in a data window on the map just like in ZeeMaps. However, the nice list feature featuring in ZeeMaps does not exist here. Otherwise, there is nothing wrong with the functionality of the service. The major advantage of this service is the edit feature built into the system, see Figure 4. Here it is possible to correct data for individual posts, although, a search and replace feature would have been very nice. There has seemingly not been any development done for mobile devices and opening a MangoMap map on your mobile phone results in a desktop version crammed into a screen of a few inches. All in all this is a very nice looking map for desktop use – and the good possibilities of personalization makes this the favorite of the stylistically focussed onomastician. MangoMap is a good deal more intuitive than usual desktop GIS and the upload facilities are difficult to fault (although more upload formats could have been wished for). But taking into account that MangoMap is under ongoing development by a small firm, it is amazing how much you get from this online service already by now. It is difficult to pick a clear winner from these two. ZeeMaps has some nice solutions for the desktop version and mobile devices alike and offers a good overview. However, when it comes to putting you own mark on your map, MangoMap is far superior. Since MangoMap only allows genuine GIS-formats for upload, polygon, line and point data can actively be queried, something which is not possible to the same extent in ZeeMaps. So which one to choose? That depends entirely on your needs. If you want a quick and effective map for desktop and mobile devices, go for ZeeMaps. If you want to personalize your maps, go for MangoMap. And if MangoMap delivers what they promise, its features will grow steadily by and by. ZeeMaps, on the other hand, looks as if it is a finished product and what you see is what you’re most likely to get in the years to come.